I am super excited about being selected as a vendor for One Kings Lane's latest shopping experience, Vintage & Market Finds. 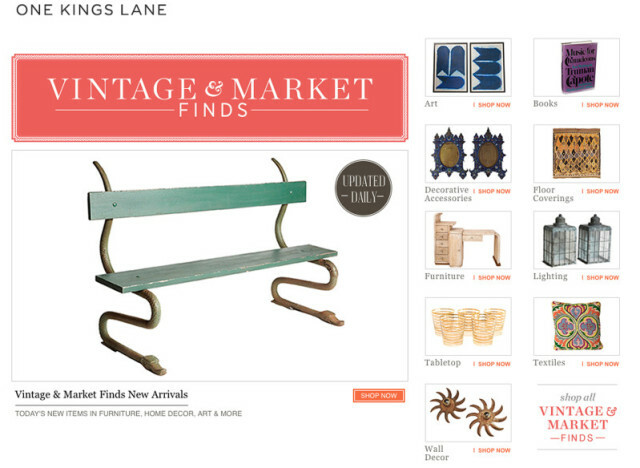 As its title suggests, this newly launched resource offers vintage, interesting, and one-of-a-kind furnishings and accessories. OKL has scaled down the sometimes daunting task of searching for decorative needs, by offering a smaller curated collection of finds from vendors all over the country. Items are posted daily and available for sale for a 5 day period. Shopping categories include: Art, Books, Decorative Accessories, Floor Coverings, Furniture, Lighting, Tabletop, Textiles, and Wall Decor. Click here to preview my current items posted and watch the recently released video below from OKL, What Is Vintage?, with noted designers defining the term and interpreting the style.